In early 2012 I was approached by NV Engines and asked if I would be willing to do a long term evaluation of a new gasoline engine for them. As I tested other glow engines for them in the past, I, of course, was delighted to do so. I have had numerous NV engines over the years and currently have 12 of them flying. When the engine arrived, I opened the box and took a look inside. At first glance it looked like a normal NV 40 glow engine. Closer inspection revealed a different style head with a turbo plug as well as a larger carburetor. But what was more interesting was what was not there. No CDI ignition unit, no spark plug wires or ignition cut-off switches, and no pumper carburetor. Instead there was a normal looking carburetor and a glow plug. This was definitely not your father’s RC gasoline motor. Mixing the fuel: Since this is a 2-stroke gasoline engine, it needs lubricant mixed with the fuel before running. This is no more difficult than mixing the fuel for your weed whacker, chain saw, or small outboard motor as long as you follow the simple directions. The fuel is a simple mix of straight technical castor oil and pump gas. Castor oil does not easily mix with gasoline and takes a bit of time to properly dissolve. The proper way to accomplish this is to mix the fuel batch, then let it sit for a week before mixing it up again and using it. If you are ordering a motor, it will save you some time to mix up a batch of fuel while you are waiting for the motor to be delivered. For my testing I used 93 octane gas and Klotz Benol castor oil as it mixes easier with gasoline. After taking it out of the box and reading the instruction manual, I mounted an 11X6 prop on the motor and placed a few squirts of oil into the glow plug hole and down the carburetor throat. I then proceeded to flip the motor over by hand the suggested 100 times. For those of you familiar with the NV engine line, this will be standard procedure. NV has the materials and equipment to manufacture and assemble their motors with very tight tolerances and puts this to good use. For this reason the cold break in is necessary to start the seating process without causing any unnecessary wear to your new engine. After completing this step I mounted the motor to my test stand along with a 6oz tank with a gasoline stopper and fuel lines. The instructions stated to run the motor between 5,000 and 7,000 rpm for the first 10 or 15 minutes after start up, so I assumed I would go through a couple of 6oz tanks of fuel. After adjusting the needle setting as per the manual and priming the motor, the motor started easily with a few bursts on the electric starter. After about 30 seconds of running, I disconnected the glow plug clip, not sure what to expect. Amazingly it ran just fine, much as I would expect from any nitro motor with a glow plug. I set the throttle to a little less than ½ and checked my tach reading to keep it within the 5,000 to 7,000 range. This is not a “Set it and forget it” operation. Within the first 2 minutes of running I was backed off to ¼ throttle to keep the engine under 7,000 rpm. At the 10 minute mark I checked the fuel and was surprised to see it wasn’t even near the halfway mark yet. Now this engine was starting to get my interest. After 15 minutes of break in, I started to throttle it up to full throttle. Leaning out the needle a bit pushed the tach to 12,000 rpm. I quickly richened it up a couple of clicks and throttled back just a bit. As I still had fuel, I made additional run ups to full throttle and back down to idle and spent the remainder of the tank running for a minute at full throttle, then back down to 7,000 to cool off a bit between run ups. It finally exhausted the 6oz tank of fuel at 36 minutes. Wow! I was used to NV motors being known for fuel efficiency, but this was an entirely new ballgame. I ran through a second tank of fuel gradually getting the mixture leaner as it broke in, but still staying 500rpm or so rich off of peak. After the second tank I proceeded to set the low speed needle for best transition and stable idle. The motor would idle down to 1600rpm, but I found the best transition to just slightly rich of that. On a side note, as this engine changes so much during the first 2 tanks, I would strongly suggest doing this on the ground. If I had flown the engine, in the time I had taken off and flown the plane around for a 15 minute flight, the sustainable idle speed would have climbed another 500 to 1,000 rpm, making it very difficult to land and impossible to shut down. Since I already had a NV AX40 mounted in a World Models LA 40 Racer, it seemed to be the perfect plane to test the motor in, as well as compare it to the nitro version. The engine swap was an easy 15 minute affair as the mounting lugs are identical between the two motors, so it was simply a matter of swapping out the tank with one with a gas stopper and lines and bolting the motor in. As an added bonus, the two motors are almost identical in weight so no CG balance change was necessary. NV did include one of their new, straight out mufflers with this engine. My 40 Nitro had the standard tilt down muffler, so the new one fit the cowl just fine with no alterations. I also added the in line fuel filter to the recommended K&S fuel line. I ran one more tank of fuel through it in the plane just to make sure there were no leaks or fuel system problems and to further complete the break in before heading to the field. Since I had been running an APC 10X6 on the Nitro 40, I thought I would start there. Upon starting and throttling up, it quickly exceeded the recommended usable 14,000 rpm limit. I then mounted an APC 10X7 which peaked out at 13,000 on the ground and still held a great idle. Having settled on a prop, I taxied out to the flight line. The plane quickly accelerated at ¾ throttle and climb out was much steeper than with the 40 Nitro. This motor makes a great deal of usable power. After flying the circuit for a few turns I started some basic aerobatics. Loops were much larger than with the nitro motor and the engine pulls strong all the way through the maneuver. Inverted flight had little to no change in engine pitch or speed. Hammerheads were as tall as I wanted and throttle response was steady and even through all changes. Coming in for slow touch and goes were straight forward and accelerating from slow landing speed to full throttle into a hammerhead were effortless. On the bench, the gas engine revs up just slightly slower than the nitro version due to the difference in fuels, however in flight it is not noticeable. Landing was uneventful and the motor will idle down to walking speed without quitting, even during less than perfect touch downs. After the first flight I checked the fuel left in the tank. It had burned slightly less than 3 1/2oz of fuel! Subsequent flights revealed that once properly adjusted, the engine simply cannot be forced to flame out or stall. In fact, in over a year of flying this motor, I have yet to experience a flame out or dead stick landing. I have also yet to go through a half a tank of fuel in any one flight. The fuel economy on this motor is superb! Another big benefit is the easy clean up of the airframe after flight compared to a nitro engine. While the exhaust tends to be darker than nitro fuel, there is far less residue and it wipes off much easier than nitro fuels. Once fully broken in, additional props were tried. The APC 11X6 proved to be the smoothest operating of all the props, providing great thrust at 13,000 rpm, a very stable idle and is indeed a great general purpose choice for this engine. 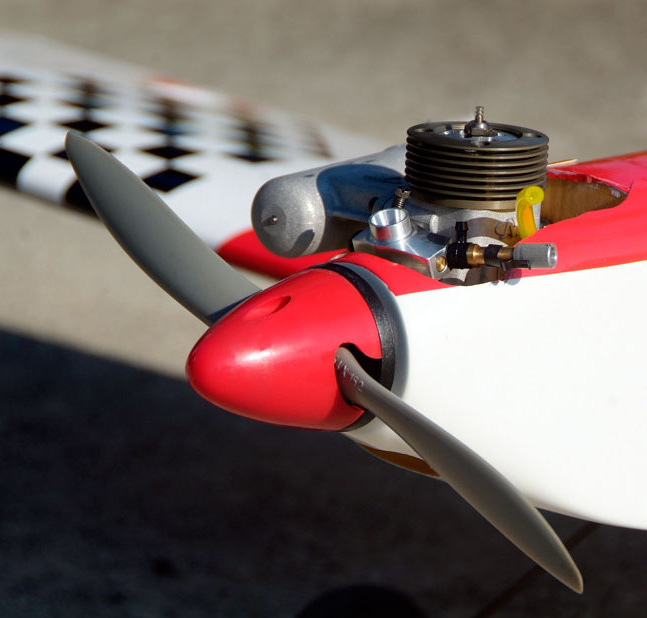 The 10X7 spins slightly faster at 13,500 and is a great choice for smaller, faster sport planes like a Kaos. The APC 12.25X3.75 spins at a slightly slower 12,200 but provides tremendous thrust and very slow landing speeds, as will a 12X4 and are well suited for large Cub type planes. Props that did not give good results included the MAS 10X7 (under props the engine and does not provide enough load) APC 13X3.75 (too much prop for a 40) MAS 12X5 (serviceable, but the APC 11X6 will outperform it in speed, thrust, and acceleration). That being said, the rpm numbers do not tell the full story of the power output of this engine. The power curve is different than a nitro motor and leans more toward that of a four stroke. When the engine is pulled vertical in an up-line, the power fall-off is far less than its nitro cousins and it happily motors along, continuing to eat up altitude. The same effect is felt when doing large loops or vertical eights and it pulls strongly throughout the manuvers. After a full year of flying, there has been no loss of power, in fact power output steadily climbed all the way through the first gallon of fuel. Fuel economy has remained outstanding and as noted earlier, I have been unable for even force a flame out. Starting the motor has proved to be easy, I usually richen the needle up about ¼ turn, give it a good prime (be careful not to over-prime as this is a much higher compression motor than other gasoline engines) and it starts easily with a quick burst of the electric starter. I have been able to hand start the motor, but it needs to turn over at a higher rate than the nitro to start, so use of the electric started is recommended. I tend to leave the needle slightly rich on the ground as it does lean out well in flight. I have also not needed to change the low speed needle setting throughout 4 seasons of temperatures. After a year, I did pull the head and inspect the piston and cylinder for wear. Even though I had flown this motor far more hours than I usually fly my other engines in a year, the wear was minimal and what I would expect to see on a motor with far less time. I am also still using the original turbo glow plug supplied with the motor, and it shows no sign of failing anytime soon. Overall I have found this motor to be a great flying engine, it has great power for its size and is not at all underpowered as some of the gas conversion motors tend to be. The fuel economy is amazing and between the low cost of fuel and fuel efficiency, it has the lowest cost-per-flight of any of the planes I own. NV has produced another winner to add to their already exceptional line up of engines. Last Edit: 5 years, 7 months ago by admin. How does a gas engine run with a glow plug I read the forum and I am still confused how this can be. Great job on this NV! WOW! I ran my GX.40 for the first time today. I used a test stand and followed the break in instructions to the letter. YES, I am impressed. To be truthful I didn't believe a glow motor would run on gas. This engine started up instantly and when I took the glow plug ingniter off there was no difference in sound or rpm. After the two runs at 7500 RPM I opened the throttle on the third run. With the needle at 1.5 turns from closed I got 11900 at full throttle. I then adjusted the needle to top RPM and the tach showed 12,700. I backed the needle valve back down to 12,000 and let it run for another 10 minutes. I then tried to idel it and could only get it to idel smoothly at 4500. Next time I run the engine I will play with the low speed needle and I'm sure it will idel slower. Every one at the field today was impressed. like I said befor "HOW DO THEY DO IT"? Sounds good so far. It still may need a bit more running in. Make your low speed adjustments in very small increments and let it run a while in between. Do not go for the lowest idle, that will come. Just adjust for the best transition for now. While I'm impressed with my GX-40 I can't get it to run reliably in the air, it "flames out" after a minute or so, usually as I open the throttle from about the mid throttle position (where it seems to run sweetest). It idles reliably and picks up cleanly but even though I set it into the air "slobbering rich" it's still likely to make a lean seeming cut after a minute or so. The tank is only 4oz (good for 15 minutes of flight plus landing reserve), laid in a flat rectangle position and is at the correct height and as near to the engine as possible. Prop is 11x6 APC, which, even after well over 2 hours running is only turned at 10,500 rpm peak, I take off with far less than this. Any ideas on why it's so unreliable. I've tried opening the idle needle to see if this helps the lean seeming mid range but this just seems to spoil idle (3,500 minimum before it stops)and pick up.